Here at Paint it we are so confident in our work that we are proud to offer a three year guarantee on paintwork. We believe that quality is paramount so we make sure that our technicians are highly trained to guarantee that the paint on your wheels will not flake or peel off. 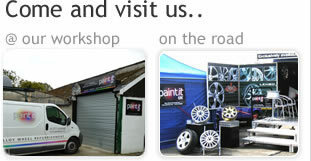 Paint it also gurantee invisible repairs and that your wheels have a premium glossy finish. Dave Waters, Chelmsford - Excellent service, wheels looked like new. Quick service as well, I would recommend. John Dixon, London - I would strongly recommend Paint it and will recommend to family and friends. Steven Norwood, Billericay - I can't praise Paint it enough. When I kerbed the wheels on my car quite horrifically, I thought there was nothing that could be done about it. I called Paint it and they were exremely helpful and polite. I got my wheels back within a day and couldn't believe how invisible the damage was. Thanks Paint it UK. Nick Foster, Shenfield - Very punctual and lovely young chaps. Showroom quality finish at great prices. Would highly reccommend. Mark Shrosbry, Brentwood - Very happy with the service. Great prices and real nice guys. Kat Roger, Billericay - I thought I was done for when I got a flat spot in my boyfriend's car wheel. Paint it UK repaired the flat spot and re-balanced the wheel before my boyfriend even found out!